TGIF again! These days have gone by so quickly... Today's message is about accepting who we are, with our strengths and weaknesses, and never ever comparing ourselves to someone else. Everyone walks a different path, everyone struggles with different situations and enjoys different pleasures. God has never created the same individual twice, and that's the beauty of life. 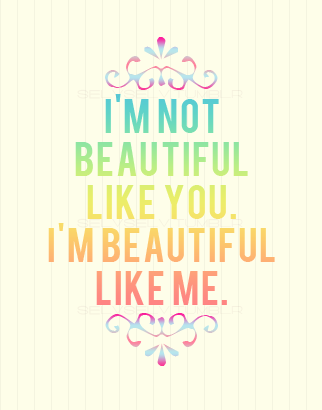 All of us have different qualities, and that's what makes us beautiful. So let's not forget being our truly selves, and knowing that "you are the best person to be you". & thanks again to happy things for the beautiful message.